'It is truly a masterpiece put together by a couple of our local neo-music/poetry visionaries.’ Review in Presto 92. Janet Moyer. 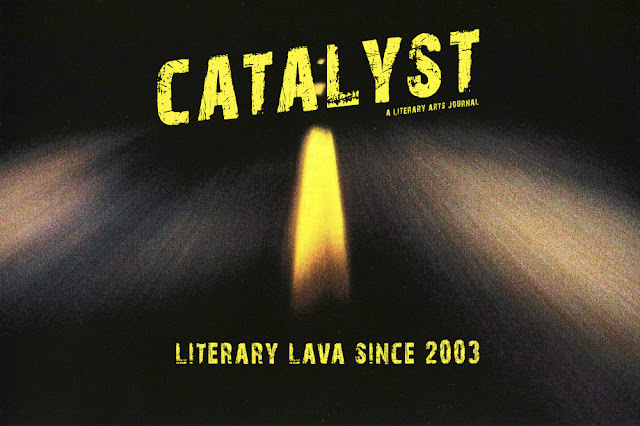 Catalyst is a literary arts journal originally published by a collective of artists known as Neoismist Press inside an old volcano in Whakaraupo/Lyttelton, NZ. Without significant funding support it is largely produced on innovation, guts and enthusiasm, quietly spewing literary lava since 2003, often innovative in format and always editorially daring. As of Volume 10, released in 2013, Catalyst is now published by The Republic of Oma Rāpeti Press. Volume 1 erupted with a swag of emerging Canterbury writers, a bold, full-colour cover, perfect bound, boasting high design values, quirky artwork, faux advertising and visual art/poetry hybrids, it promised a lively new voice and unique aesthetic among NZ literary journals. 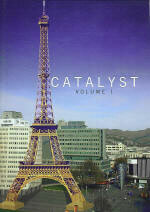 Catalyst is one of only two literary magazines published in Christchurch. It differs in that it focuses solely on creative writing and does not publish reviews, criticism or other non-fiction articles. Graphic design, visual art and unusual formatting also contribute to the unique Catalyst aesthetic. It has published graffiti poetry from Italy, photography from West Sahara and Berlin, political graphic montage from New Zealand and taxidermy from Lyttelton. A steadfast commitment to presenting emerging/young writers alongside established voices ensures the magazine maintains a vital energy, determined to surprise. Catalyst has a continuing interest in experimental and non-traditional forms often neglected in literary journals including song lyrics, script/screenplay excerpts, spoken word, rap and performance texts, visual poetry and graffiti. As of Volume 3, Catalyst began to expand its focus towards a more international flavour with the introduction of its first feature poet - international performance poet, artist and author Jim Christy. 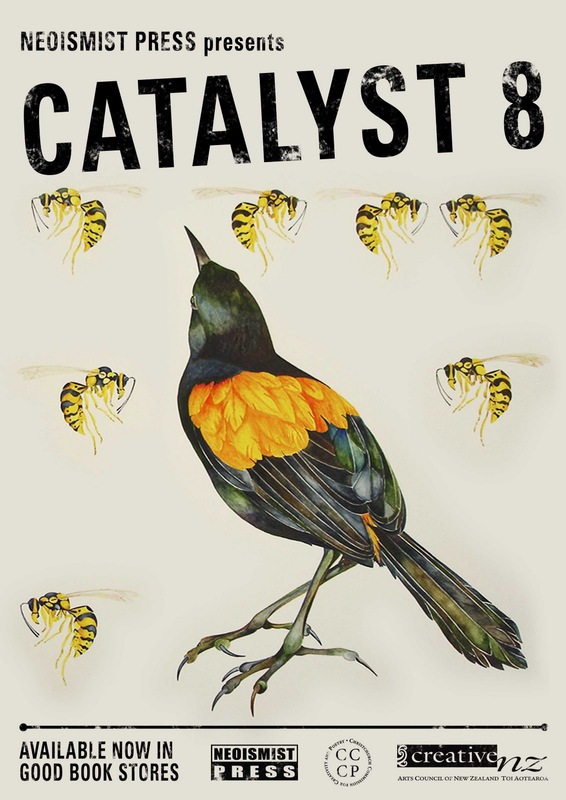 Since then Catalyst has become ever more international and regularly features poetry in translation including Croatian, Japanese, Spanish, and Bengali alongside young and emerging writers from New Zealand. Catalyst has published writing from India, United Kingdom, Australia, West Sahara, Cuba and featured poets from South Africa, United States, Canada and of course New Zealand. Catalyst believes strongly in the importance of presenting emerging and established New Zealand talent alongside international voices thereby opening two-way doors for NZ writers. These connections led to the publication by Neoismist Press of a bilingual anthology of emerging writers from both Cuba and New Zealand called Alchemy of the Islands. Alongside the print journal, Catalyst has actively promoted a renewed interest in spoken word. Before Volume 1 was published in 2003 Catalyst had established a fortnightly open mic performance poetry night. 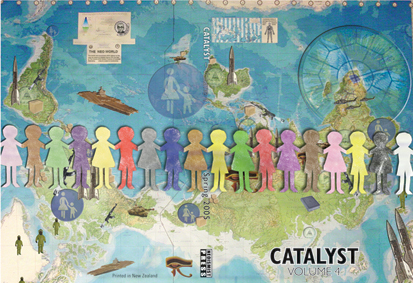 This forum has continued to run ever since, switching to monthly in 2007, making it one of the longest continuously running poetry nights in New Zealand, spawning an annual poetry slam - Poetry Idol - in 2004 and leading to the development of a CD of spoken word/music collaboration eventually published in the spring of 2005 with Catalyst volume 4. This was the first time a literary journal in NZ launched a regular spoken word recording, a phenomenon much emulated in NZ publishing since then. The album received attention for its seamless mixing of original NZ music (submitted especially for the album) with a range of emerging and well known NZ poets’ original work, under the visionary production skills of Jody Lloyd aka Trillion. The CD enabled poets to expand their audience into the music fraternity and vice versa. Since 2005, New Zealand has increasingly embraced the sound of it’s own voice in spoken word and several notable books have been published with accompanying CDs to celebrate this. Catalyst continues to champion emerging voices and marked its seventh edition with another CD, this time examining the voice of the songwriter and their relationship with poetry. 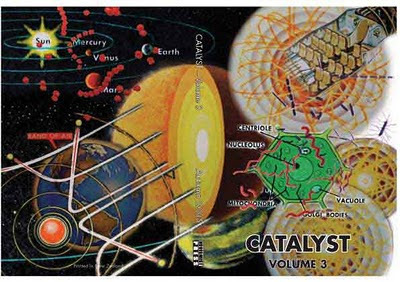 Catalyst volume 7: The Original Branch Manual explored where poetry and songs meet and diverge by contrasting poems and songs in harmonious blends instead of using music in a subordinate role to enhance the poetry as was the case on the first CD. Volume 7 published seven poets, seven songwriters and seven visual artists. It broke dramatically from its customary book format enabling it to be distributed widely in NZ and also in Australia via music outlets as well as the traditional independent book shops. The launch event for Catalyst 7 was featured in The Press Christchurch Writers Festival 2008 and was presented as a live performance of The Original Branch Manual (with some extra poetry and music thrown in). The event was reviewed by one publication as the highlight of the festival. The success in the 2008 Christchurch Writers Festivall led to an approach to present a major new performance poetry work in the 2009 Christchurch Arts Festival - 'Love Letters in the Margin'. Catalyst maintains an active community on Facebook, sharing and promoting a wide range of events and news particularly from the Christchurch poetry/performance scene. Like and follow the 'Catalyst Literary Arts Journal' page to get up to date information regarding events, deadlines and opportunities.